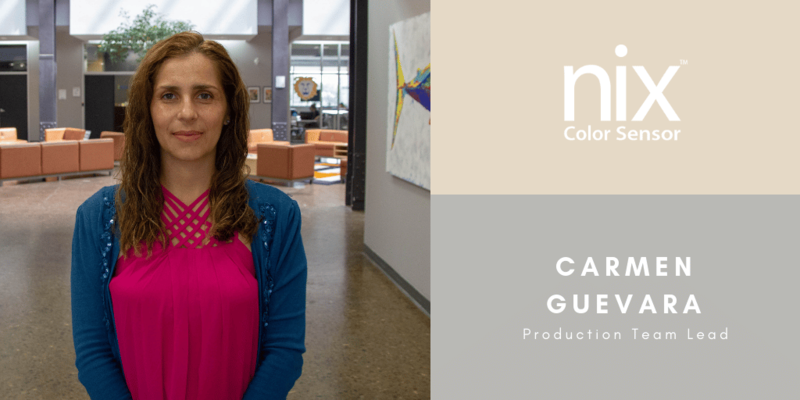 Carmen Guevara is a Production Team Lead at Nix Sensor Ltd. She has been with Nix for the past 5 months, and continues to succeed in her role. Carmen is an arts, color, and design enthusiast! As a Production Team Lead, she is able to demonstrate her artistic skills in a positive and efficient environment. She continues to take her 15 years of work experience to improve the functionality of production at Nix. She admires that Nix can be a place where growth is nurtured, and where she is able to freely express her own ideas to improve the production process. I am passionate about designing, painting, building, and color. I have always loved building, and making things from scratch. I enjoy being the Nix Production Team Lead because I can create, learn new ways to do things, and utilize my previous work experiences to improve the company. Beyond production, I am also a journalist. I enjoy writing, designing, media, and I love working with the community. When I began working at Nix, I was trained under the students working here! It was such a pleasure to learn from them, and have conversations in both English, and Spanish. My two favorite paint colors are Bone White PPG1085-2, and Gray Stone color from Dulux. My family is a big fan of Dulux paint!